We are all “Fighting Gravity” every day of our lives. 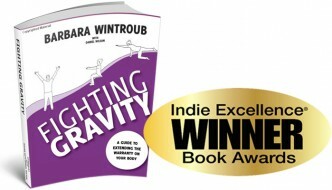 As we move through time and become seasoned individuals, “Fighting Gravity” becomes a difficult challenge. Standing up straight, gaining no extra weight, exercising three days a week minimum and keeping your sense of humor makes aging not for sissies. We don’t need another fitness book trying to make us into 30 year old, body beautiful, human specimens. What we do need is a humorous self help fitness book for the 65% of people who don’t exercise. We do need a logical, easy equipment free, positive approach to “move it or lose it”. How do we begin a fitness program that is safe, relatively pain free and still have a good time. The motto here is “Just Suit Up and Show Up”. Draft your friends who will stick by you during this glorious but sometimes trying experience. Learn to exercise at work, in your car or truck, while on vacation or on your bed. Use objects around the house like stairs, front door or water bottles to promote fitness. Collect points and a “Yea for You” each time you do something positive. The end result will be a new you, feeling and looking better, taller, improved breathing and stronger muscles. You will earn an “Extended Warranty” on your body parts. “Fighting Gravity” is the book you will want to give to your friends, family members and other loved ones to motivate them to fight gravity with you.